Modern skyscrapers are typically made from concrete and steel, but as architect Michael Charters suggests, wood could be a viable construction material for tall buildings that would have a lower environmental impact. Charters recently designed ‘Big Wood,’ a prototype for a large-scale skyscraper made from wood for the 2013 eVolo Skyscraper Competition. The sprawling mixed-use complex would serve as a sustainable alternative to standard building materials, which are expensive and require a great deal of energy to produce. The construction industry accounts for about 39 percent of all man-made carbon emissions—a figure that would be greatly reduced if more buildings, big and small, were made from timber. As we learned in high school science class, trees have the ability to capture and sequester carbon, and they continue to store carbon when used as a building material. 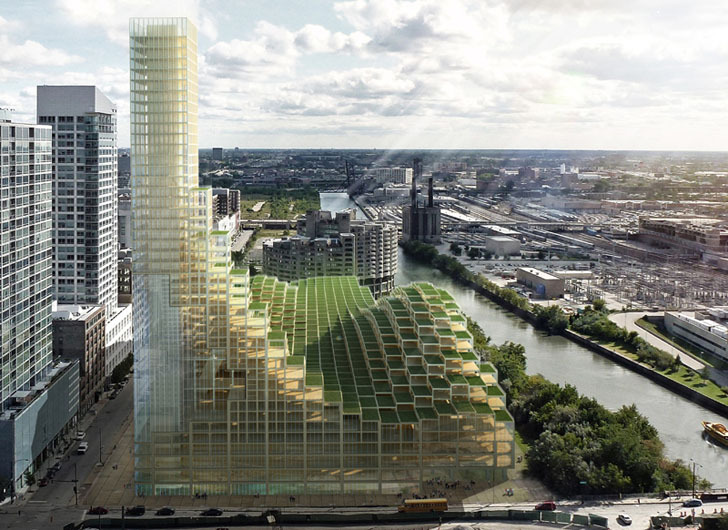 Recent studies have demonstrated that it is possible to build 20- to 30-story structures from timber, writes Charters, and hybrid systems would enable builders to build even taller buildings. Wood burns, no matter what people say about charring of the outer layer. Sprinklers can be used, but they fail at times. Life safety is a big issue here and can't be ignored. And since wood and its lightweight construction won't last, more energy will be required to rebuild it in 50 years. Not so sustainable after all. Didn't they build with wood before the Great Chicago fire and then built with masonry afterwards. Haven't we learned from the past? Nicely done Mike. I live in the south loop. It would be great to see Chicago claim yet another first in construction techniques. I am sure it would take some explaining but Chicago is a city that would likely support this type of innovation. I think the Fire Marshal would be most concerned with the facts. Chicago\\\'s Grand Central Station reborn in wood,glass and greenery on the same spot. This is certainl;y aesthetically pleasing, but how is it that would can suddenly be strong enough to support a 20-30 storey building? Also, where is the wood coming from, transporting the materials can be as big an environmental problem as creating them. That´s the most common impression, but actually, it´s the opposite. The main difference between a wood structure and a metal structure in case of a fire, wood columns last longer to collapse. This is because, although steel does not burn, it does melt and become maleable at a certain temperature, which if reached during the fire, the whole structure collapses suddenly. Wood on the contrary, burns on the exterior and this carbonized skin protects the core against the fire, so it is preferable to steel, as gives time for the people to evacuate before the collapse. Looks an awful lot like BIG's lego museum... i wonder whose came first? Modern skyscrapers are typically made from concrete and steel, but as architect Michael Charters suggests, wood could be a viable construction material for tall buildings that would have a lower environmental impact. Charters recently designed 'Big Wood,' a prototype for a large-scale skyscraper made from wood for the 2013 eVolo Skyscraper Competition. 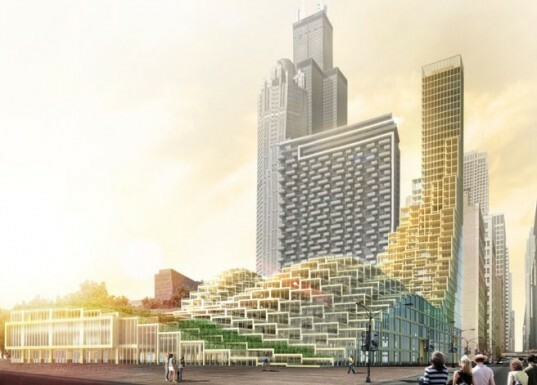 The sprawling mixed-use complex would serve as a sustainable alternative to standard building materials, which are expensive and require a great deal of energy to produce.